SAN ANTONIO — Less intense treatment of low-risk human papillomavirus (HPV)-related oropharyngeal cancer achieved a high rate of pathologic complete response (pCR) and favorable patient-reported outcomes, a preliminary trial showed. Overall, 37 of 43 (86%) patients achieved pCR with deintensified chemoradiation, including all but one evaluable primary tumor. The pCR rate was virtually identical to historical rates achieved with standard regimens, according to Bhishamjit Chera, MD, of the University of North Carolina (UNC) at Chapel Hill, and colleagues. Selected patient-reported adverse events peaked during the first 6 to 8 weeks and then declined thereafter. About 40% of patients required feeding tubes for a median duration of 15 weeks, but no patients required permanent feeding tubes, they reported here at the American Society for Radiation Oncology meeting. The regimen consists of lower doses of radiotherapy and concurrent cisplatin, administered over 6 weeks. With high-dose therapy, the radiation protocol requires an additional week. The study reflects the current trend and momentum in the management of HPV-positive oropharyngeal cancer, said Zain Husain, MD, of Yale Cancer Center in New Haven, Conn.
NRG Oncology (formerly RTOG) has already launched a trial using the UNC regimen, “which gives us a lot of confidence that this is a good regimen,” Husain added. Nonetheless, reduced-intensity treatment remains investigational and should not be used in clinical practice. Randomized clinical trials with adequate follow-up will be required to determine the ultimate role of less intense therapy for HPV-positive oropharyngeal cancer, he said. HPV-positive oropharyngeal cancer accounts for 60% to 70% of new cases of oropharyngeal cancer in the U.S., and the incidence has continued to rise. In general, HPV-positive disease has a more favorable prognosis as compared with HPV-negative oropharyngeal cancer. At many institutions, standard therapy for newly diagnosed HPV-positive oropharyngeal cancer consists of total-dose radiotherapy of 70 Gy administered over 7 weeks, and concurrent cisplatin 100 mg/m2 for 3 weeks. The regimen achieves a high rate of pCR but causes substantial toxicity. Given the overall favorable prognosis of HPV-positive oropharyngeal cancer, many specialists have begun to ask whether reduced-intensity treatment might be just as effective with less toxicity. Chera reported findings from a prospective phase II trial of reduced-intensity chemoradiation for low-risk HPV-positive oropharyngeal cancer. Eligible patients had diagnoses of T0-3, N0-2c, M0 disease associated with minimal or negative smoking history. Treatment consisted of a total radiation dose of 60 Gy administered in 2-Gy fractions daily for 6 weeks, plus concurrent weekly cisplatin 30 mg/m2. The regimen represented a 10-Gy reduction in the usual radiation dose and a 40% reduction in the usual chemotherapy dose, Chera said. The primary outcome was pCR and was based on experience with usual high-dose therapy, which has been associated with a pCR rate of 87%. Patients undergo biopsy of the primary site 6 to 14 weeks after completing chemoradiation, as well as resection of any initially-positive lymph nodes. Secondary endpoints included toxicity, quality of life (QOL), and clinical outcomes of treatment. The 86% pCR rate compared favorably with the 87% rate demonstrated by historical data. The overall results included pCR in 40 of 41 evaluable primary tumors (two of which were stage T0 at baseline) and pCR in the neck in 33 of 39 patients (four of whom had N0 status at baseline). After a median follow-up of 21 months, all 43 patients remain alive and without evidence of disease, including 38 patients who have at least 1 year of follow-up. Investigators evaluated QOL by means of an instrument developed by the European Organization for Research and Treatment of Cancer (EORTC QLQ H&N-35). Focusing on common adverse effects of chemoradiation for head and neck cancer, Chera noted that the severity score for dry mouth, sticky saliva, and swallowing all increased during the first 6 to 8 weeks, particularly dry mouth and sticky saliva. The score for dry mouth peaked at about 70 on the 100-point scale and the score for sticky saliva rose to a maximum of about 60. Score for dry mouth remained at about 60 at 12 months, whereas the saliva score declined to about 40. The effect on swallowing was less severe, reaching a maximum of about 20 and then declining to less than 10 at 12 months. Patient-reported symptoms exhibited a similar pattern as the dry mouth score averaged less than 0.5 (0 to 4 scale) at baseline, increasing to almost 2.5 at 6 to 8 weeks, and then declining to less than 2.0 by 1 year. Patient-rated swallowing difficulty was less than 0.5 at baseline, about 1.0 at 6 to 8 weeks, and slightly less than 1.0 at 1 year. Physician-rated grade 3/4 toxicity and patient-rated severe/very severe toxicity included mucositis (34%/45%), pain (5%/48%), nausea (18%/52%), vomiting (5%/34%), dysphagia (39%/55%), and xerostomia (2%/75%). Chera and colleagues have already closed enrollment for another phase II trial that will evaluate a reduced-intensity regimen that makes surgery optional, omits chemotherapy for patients with T1-2 N0-1 disease, and includes patients with as much as a 30 pack-year smoking history but who have a 5-year period of abstinence. A planned “third-generation” phase II trial will evaluate the feasibility of cancer genetics risk-based stratification of patients and examine more specifically the question of whether reduced-intensity treatment is possible for patients with a >10 pack-year smoking history. Researchers are proposing a new tumor-staging model for predicting the outcomes and guiding treatments for patients with human papillomavirus (HPV)-related oropharyngeal cancer (OPC), according to a new study in the Journal of Clinical Oncology. Since HPV-related cancer differs significantly from smoking-related cancer, less intensive treatment strategies may be more appropriate, the study authors concluded. Treatment regimens for oropharyngeal cancer have intensified over time and carry a toxicity burden, the Canadian researchers noted. In the last few years, research has found that oropharyngeal cancer caused by HPV behaves differently than OPC caused by smoking and alcohol, yet both cancers use the same tumor classification model. Therefore, regardless of whether the OPC was caused by HPV or smoking, the treatment and perceived prognosis based on tumor staging has remained the same, even though patient outcomes vary considerably, the study authors noted (Journal of Clinical Oncology, February 10, 2015, Vol. 31:5, pp. 543-550). A new tumor-staging model will help separate patients with promising prognoses from those with negative ones to design the most appropriate treatment strategies for each group, according to the researchers from Toronto’s Princess Margaret Cancer Centre. The researchers analyzed 899 oropharyngeal cancer patients, including 505 (56%) patients with HPV who had been treated with radiotherapy or chemoradiotherapy from 2001 to 2009. The HPV-positive patients (382) had higher recurrence-free survival rates after about four years compared with HPV-negative patients (123). Disease recurrence was 16.7% (64) among HPV-positive patients; 38.2% among HPV-negative patients (47). The tumor staging system classifies the disease into early, intermediate, or advanced stages of cancer. It helps determine treatment plans and can suggest likely outcomes. For example, a stage IV patient with HPV-related cancer has an 80% survival rate, while a stage IV patient with smoking-related cancer has a 50% to 60% survival rate. But both are currently considered to have advanced-stage disease, which is recognized as a life-threatening prognosis. The study also highlights the fact that many HPV-related OPC patients are overtreated because of the stage IV tumor classification. High-dose chemotherapy combined with high-dose radiation is often given to such patients when radiation therapy alone or other less-intensive strategies can probably cure many of them, the researchers said. “Our study shows that the current model derived for smoking- and alcohol-related cancers is not suited for throat cancer caused by HPV, a burgeoning throat cancer population in the Western world, including Canada,” Huang concluded. A new tumor staging model will help separate patients with promising prognoses from those with negative prognoses to design the most appropriate strategies for each group, the study authors concluded. Clinical trials have now begun to address these questions, but their descriptions and designs are hindered by inadequacies of the current stage classification, they stated. “Providing a relevant stage classification for a rapidly emerging disease is important, but the additional feature of the classification is that it provides the opportunity to include factors beyond just the traditional description of disease extent into the prognostic classification we are trying to develop to assist in treating patients,” he said. The structure used for disease classification follows a template that was developed at the Union for International Cancer Control in Geneva and is relevant to all cancers, according to Dr. O’Sullivan. The Princess Margaret Hospital is collaborating with six major cancer centers worldwide to validate the findings. A new research conducted by Dr. Sophie Huang, assistant professor in the Department of Radiation Oncology, Princess Margaret Cancer Centre, University of Toronto, Canada revealed that throat cancer caused by the Human Papilloma virus (HPV+) can possibly be cured. The research is of utmost importance as it is the first to provide substantial evidence to prove that patients suffering from oropharynx cancer can be healed. The disease also spreads to other parts of the body. The press release disclosed that the tumours remain passive and go undetected for over two years in most case, which makes it incurable. The research was presented at the 5th International Conference on Innovative Approaches in Head and Neck Oncology (ICHNO) on Friday. She states that cure is possible among patients suffering from oropharyngeal cancer is possible for the first time. “Our research, the largest study to date to explore survival predictors for metastatic HPV+ and HPV- oropharyngeal cancer patients,” says Dr. Huang. For the research, 934 patients suffering from HPV+ OPC were studied. All subjects were patients treated at the Princess Margaret Cancer Centre between 2000 and 2011. The researchers found two types of distinct metastases or tumours in other parts of the body away from the source in HPV+ patients: “explosive” and “indolent” metastases. The former grows and spreads quicker while the latter is slower and manifests itself as oligometastasis. However, they found the lung as the most common metastatic site in both HPV+ and HPV- patients. According to Dr. Huang, more aggressive treatments solely aimed at disease control resulted in a long term disease-free period, suggesting that some may be cured. “In the HPV+ group with oligometases 25% were still alive after three years, whereas the percentage in the HPV- group was 15%,” the press release stated. The reason for higher survival rates among HPV+ patients is the younger age of the patients. In addition, the cancer is more sensitive to radiotherapy and chemotherapy. Those who receive treatment are at an advantage and can survive longer than those who do not undergo the process. Early detection of metastases and aggressive treatment can cure the patient. Dr. Huang explained that they were aware of the correlation between the initial stages and the risk of a tumour on another site of the body. However, the degree by which they are related remains unknown. She highlights that identifying such relationships could help find an appropriate treatment at an early stage. Professor Jean Bourhis, co-chair of the conference scientific committee, says that this is a very important research with respect to finding the cure of oropharynx cancer. He states that it provides hope in both the treatment and diagnosis of the patients. 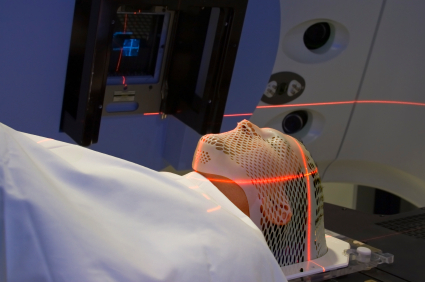 Cancer patients undergoing brain or head and neck radiotherapy are required to be immobilized, which is certainly not always popular with those undergoing the procedure, who may already be suffering from anxiety. To make things worse, in order to be immobilized completely during the procedure, it is crucial that they are wearing a fitted mold to prevent motion. Having the mold made is a whole process in itself before the procedure can begin. Topping that off with molded shells that quite often do not fit appropriately, the anxiety levels are heightened for patients — enough so that researchers centered their study around the creation of molded shells through 3D printing that could be created from data conveniently already existing in the form of a CT scan. The process would increase the comfort level for the patient and save a great deal of time in preparing a molding. Radiotherapy is a type of cancer treatment which uses high-energy rays to zap cancer cells. The procedure has to be precisely aimed directly at specific areas to have effect, and it’s not a procedure anyone wants immediately repeated; therefore, It’s important to have the head shell or molding during radiotherapy because the patient must lie still. The mold or shell holds the head and neck in the correct position, and is fixed to the radiotherapy treatment table. The shell is made in what is usually a 30-minute process, and there are a number of factors involved in the process which make it even more inconvenient, such as hairstyle, dental issues, facial hair, and more. The current method for using molds during radiotherapy in the UK is in using the Orfit mask, which is made through soft draping, in a process where soft plastic is draped over the head and shoulders of the patient and it is molded to their body. Another method for making mask3the mask or mold is completed through use of high-temperature thermoplastics which are molded onto a plaster of the patient’s face. In the study, the multiple researchers confronted the issue of patient discomfort and anxiety over the radiotherapy molds and evaluated whether it would be possible to 3D print them and if the time, expense, and product outcome would make it a feasible idea. Their focus was on 3D printing the front of a test shell, and measuring whether it would interfere with the dose being given to the patient in radiotherapy. The actual material used in 3D printing was of obvious concern as well. The researchers reconstructed the head and neck of a whole body scan at a slice thickness of 3.75 mm and processed Digital Communications in Medicine (DICOM) data from MRI or CT scans with data relating to items such as masking, segmenting, conversion of the data from black to white, conversion to a hollowed out positive head, creation of a negative shell, and then conversion to an .stl file format for 3D printing. 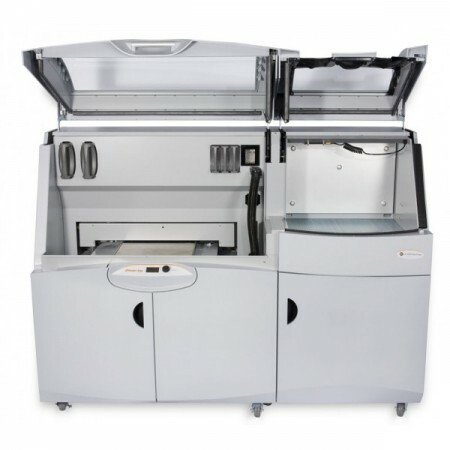 Visijet clear and EOS PA 3200 were the materials used, and researchers point out that any materials used for 3D printing of the shells should be the same or of even better quality to reach the same standard or better. Using a Z-Corps 650 printer from 3D Systems, researchers 3D printed their shells and set out to measure how they would affect the dosage being sent through the radiotherapy. Their findings were quite positive. Using three different types of materials, they found that the dosimetric properties of the 3D printing were promising in that all materials produced a small decrease in the dose of radiotherapy of up to one percent. All of the materials also produced an increase in skin dose between 54 and 80 percent, which could be minimized in using thinner materials, or creating holes in the masks, as having it increased too much is obviously not a good idea. While 3D printing of the shells proved to be a bit more expensive than the more conventional methods, the researchers point out that this can be reduced if multiple masks are created in the same build chamber. It’s also possible that multiple hospitals could coordinate to purchase 3D printers together, thus reducing upfront cost. The bottom line was that the items can be feasibly 3D printed without reducing the dose, saving patients the anxiety of having the molds created through direct contact with their bodies, and affordability should be not be an issue in the near future as prices have been coming down consistently. Successful treatment options for cancer result in more young long-term survivors prone for long-term complications. Carotid artery vasculopathy is a potential long-term complication after radiotherapy of the neck, resulting in cerebrovascular events and probably deficits in cognitive and motor functioning. Better insight into the underlying pathofysiology of radiotherapy induced carotid artery vasculopathy is needed for prognostic purposes and to develop preventive strategies. Methods: The current study is a prospective cohort study on the long-term cerebral and vascular complications after radiotherapy of the neck, in 103 patients treated for head and neck cancer, included in our study database between 2002 and 2008. Baseline protocol (before radiotherapy) included screening for cerebrovascular risk factors and intima media thickness measurement of carotid arteries by ultrasonography. Follow-up assessment more than 5 years after radiotherapy included screening of cerebrovascular risk factors, cerebrovascular events, neurological examination with gait and balance tests, extensive neuropsychological examination, self-report questionnaires, ultrasonography of the carotid arteries with measurement of intima media thickness and elastography, magnetic resonance imaging of the brain and magnetic resonance angiography of the carotid arteries.DiscussionThe current study adds to the understanding of the causes and consequences of long-term cerebral and vascular changes after radiotherapy of the neck. These data will be helpful to develop a protocol for diagnostic and preventive strategies for long-term neurological complications in future head and neck cancer patients with anticipated radiotherapy treatment.